Built-in mixer: audio & video faders, bi-filter knobs, EQs, mute & solo. Live BPM control: time stretch and tap tempo included. Touch Bar editing shortcuts on the new MacBook Pro. Autopilot: automatically plays a sequence of pads. 144 royalty-free professional video samples (available in 404p, 720p & 1080p). 36 royalty-free professional audio samples. Generators: includes 48 real-time generated & audio-reactive glsl files. Overlays: includes 13 transparent background video samples. Direct output to a secondary screen for live performance. Picture control: video projection mapping & master video editor. Record your performance live in high-quality MP4 video. Share your recordings via YouTube and Dailymotion. Import your own video & audio samples onto the grid. Import your own images and logos onto the grid (jpeg, png & bmp). 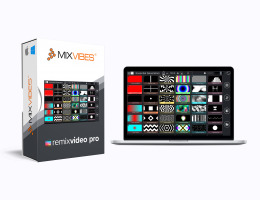 Supports main AV formats & video codecs (avi, mjpeg, mov, mp4, mpeg...). Alpha layer: make a color transparent with chroma key or use HAP codecs. Live video input: play webcam or camera input onto a pad. Syphon support: share video output with other mapping/VJ software. 2.0 GHz Intel Core i5. Recommended: Windows 10 & dedicated GPU. If any doubt, try the demo first. MIDI Support: Launchpad Mk2, APC Mini, APC 40, APC 40 Mk2 & Base 2. MIDI Learn: quickly assign MIDI commands to any controller. Audio Live Input: get BPM, waveform & frequency from external sources. You may download the trial verison of Remixvideo HERE!